The Bullseye Coral is not only attractive, but a hardy stony coral as well! The Bullseye Coral Caulastrea curvata forms large, low growing colonies in the wild, reaching over 16 feet (5 m) in diameter. Its distinctive branches are much more openly spaced than other Caulastrea species. The sprawling corallites grow from a common base and are elongated, twisted, and branched. The branches closest to the periphery of the colony often curve upward, giving them their distinctive species name "curvata" and the common name of Curved Finger Coral. Some other names it is known by are Torch Coral, Trumpet Coral, and Candy Coral. Each polyp of the Bullseye coral initially grows on its own stalk, but they will often divide as they grow upward. The polyp colors are pale brown or green, and can have a green or yellowish brown center. Their septa tends to be exaggerated, so an appearance of white "stripes" can appear, giving it that "candy cane" appearance. However, the striping can fade it the light is too bright or the water is too nutrient rich. The C. curvata is not the most commonly collected species due to their colors being somewhat more dull, but it has been propagated in captivity. In general aquacultured specimens are hardier, and sometimes have a little more variation in the shades of their colors than those typically found in the ocean. Its close relatives, the popular Candycane Coral Caulastrea furcata and the Trumpet Coral Caulastrea echinulata are also captive propagated, and readily available in some very beautiful varieties. The Bullseye Coral s easy to care for, it can be recommended to beginners. It likes a medium to low water movement and low to moderate lighting. These corals will expand in the morning before the lights are turned on and put out a circle of long tentacles similar to the pistols in a flower. Very interesting to watch! Caulastrea corals do have big appetites, so they need to be fed regularly. They can be fed when the tentacles extend but it is not necessary to do so as they will feed during the day when food is present. This video shows how different C. curvata appears when their feeding tentacles are out. It is ironic to say they are fine in a nano tank (as one or 2 polyps) but can grow to 6 feet across in the wild! Feeding them several times a week and turning off the pumps that may pull away target fed foods for 15 minutes after they grab their dinner, will help them grow quickly! Avoid strong light and strong water movement. Those tentacles pack a powerful punch to other corals who use their sweepers to invade the Bullseye Coral's space! This video shows what a Bullseye Coral looks like typically during the day. The tentacles are not fully out, and this one is more than likely an aqua-cultured specimen. Wild ones are more of a dull brown. The differences between this and C. furcata is that the fleshy polyps are much smaller or less puffy and swollen than C. furcata. Distribution / Background Caulastrea Coral Information: The Bullseye Coral Caulastrea curvata was described by Wijsman-Best in 1972. Some common names these corals are know for are Curved Finger Coral, Bullseye Coral, Torch Coral, Trumpet Coral, and Candy Coral. The C. curvata has been propagated in captivity. In general, aquacultured specimens are hardier, and sometimes have a little more variation in the shades of the colors they are typically found with in the ocean. Where Caulastrea Corals Are Found: C. curvata are found around New Caledonia and Australia on the Great Barrier Reef and Coral sea, but they are not found as of yet on the west coast. Caulastrea Coral Habitat: The Caulastrea genus are primarily found on reef slopes with sandy substrate in shallow, bright water with a surging water flow. C. curvata are primarily found on reef slopes and flat substrates at depth to 131 feet (40 m). Status The C. curvata is on the IUCN Red List of Endangered Species as VU (Vulnerable). Description What do Caulastrea Corals look like: The Bullseye Coral C. curvata is a branching formation coral. They form large, low growing colonies in the wild, reaching over 16 feet (5 m) in diameter. From a common base, they form short stalks that often split into several long corallites heads that number from 2 or more. 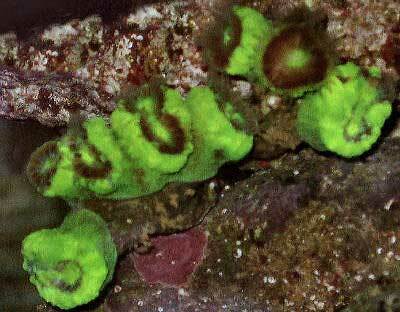 Its distinctive branches are much more openly spaced than other Caulastrea species. The sprawling corallites are elongated, twisted, and branched. The branches closest to the periphery of the colony often curve upward, giving them their distinctive species name "curvata". The polyp heads are irregular in shape and are about 8 mm in diameter. The polyp colors are pale brown or green, and can have a green or yellowish brown center. Their septa tends to be exaggerated, so an appearance of white "stripes" can appear, giving it that "candy cane" appearance. However, the striping can fade it the light is too bright or the water is too nutrient rich. Difficulty of Care Caulastrea Coral Care: The C. curvata is easy to care for, it can be recommended to beginners. Low to moderate lighting and a medium to low water flow is recommended. It has been said that the green polyped animals are easier to maintain than the brown polyped specimens. They are very sensitive to metal halides, lighting from these sources needs to be indirect. Also, make sure that detritus does not build up between the colony branches. These corals will expand in the morning before the lights are turned on and put out a circle of long tentacles similar to the pistols in a flower. Very interesting to watch! They can be fed when the tentacles extend but it is not necessary to do so. Foods / Feeding Caulastrea Coral Feeding: The Caulastrea corals, like other large polyp stony (LPS) corals, have developed several feeding strategies. Through a symbiotic relationship with a marine algae, known as zooxanthellae, they receive some of their nutrients. They also capture planktonic organisms, food particles from the water column, and can absorb dissolved organic matter. In captivity, they can be fed when their tentacles are out, but they will come out during the day if food is detected. Feed finely minced seafood of any kind as well as mysis, and similar sized foods. They do need to be fed at the very least twice a week, and grow quite well with regular feedings. It does help to turn the water pumps off during feeding. Aquarium Parameters A well-feed live rock/reef environment is what is needed for your Bullseye Coral, along with some fish for organic matter production. A mature tank is recommended. Be sure to have proper water movement and provide sufficient lighting. It likes a medium to low water flow and low to moderate lighting. They are very sensitive to metal halides, and need to have indirect lighting from these sources. These corals will expand in the morning before the lights are turned on and put out a circle of long tentacles similar to the pistols in a flower. They can be fed when the tentacles extend but it is not necessary to do so. This is a semi-aggressive species when close to other corals. Water Movement: Moderate / turbulent, surging currents are said to help increase polyp division. Water Region: All areas of the aquarium, depending on lighting. Compatibility and Social Behaviors Caulastrea corals can be semi-aggressive when close to other corals, so do need some distance between themselves and others. In general, saying that a coral is peaceful due to shorter tentacles is not completely accurate. The Bullseye Corals may only have 2" sweeper tentacles, but they pack a bigger "punch" or stronger sting than many other corals with 6" sweeper tentacles. When the 6" sweepers from other corals hit C. curvata, they will be harmed from invading the Bullseye's space. In the wild, the Caulastrea species are often found with commensal sponges, mollusks, zoanthids and other sessile invertebrates. Zoanthids tend grow in-between the coral's heads, but do not seem to bother the coral. Breeding and Reproduction The large polyp stony (LPS) corals are are hermaphrodites, male and female within the same organism, and can reproduce both sexually and asexually. In the wild they reproduce sexually by releasing eggs and sperm at the same time, resulting in a fertilized egg which then forms into a free-swimming planula larva. Eventually the planula larvae settles onto the substrate, becoming plankters. This then forms a tiny polyp which begins to excrete calcium carbonate and develops into a coral. Planula larvae are extremely vulnerable to predation, and very few survive. The C. curvata are hermaphrodites that fertilize externally through mass spawning events. The Caulastrea genus reproduce asexually as well. In captivity, the C. curvata can propagate by fragmenting, as well as by intratentacular budding (when a polyp divides into more polyps and then pinches off to a new branch). Propagation is super simple with this genus! Simply cut the branch that the polyp head is on with a bone cutter or something that will cut clean and quickly. The only problem you may have is if you cut too close to the polyp and cause a fracture that tears the polyps flesh. This is a problem when using weak or dull scissors as well. Happily, they should heal with good water flow. Glue the frag to a plug or rock. You can use the 2-part epoxy or underwater putties. Potential Problems The Caulastrea spp. are fairly hardy but recession is seen at times on one or more polyps in a colony, but that does not mean the whole colony is in danger. Boring worms, sponges, and algae can cause this condition. Brown jelly can also occur, but a simple dip in a lugol's solution (follow directions on bottle) and periodically using a turkey baster to blast off the jelly, will do the trick. Treating in a separate quarantine tank may be necessary if there are other large polyp stony (LPS) corals in the tank. Availability Caulastrea Corals for Sale: The Bullseye Coral C. curvata is very easy to find at pet shops and on line. Online they can run about $49.00 USD or more depending on size and/or color. The C. curvata has been propagated in captivity. In general, aquacultured specimens are hardier, and have been developed into much more colorful animals, including more intense variations of their colors.